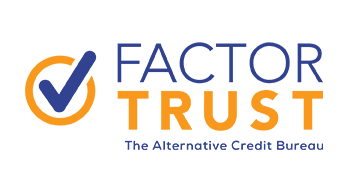 Since 2006, FactorTrust has been dedicated to proven analytics and clean credit information that provides lenders opportunities to grow more revenue, meet compliance regulations and serve more consumers with more credit options. It is the leader in helping lenders give underbanked consumers–the Credit Climbers™–the credit they deserve by providing the most comprehensive source of alternative credit information not available from the Big 3 bureaus. At its core is real-time data, analytics and risk scores needed to make informed credit lifecycle decisions. For more information on the company or the quarterly FactorTrust Underbanked Index, email sales@factortrust.com, visit www.factortrust.com or call 1-844-205-4111.